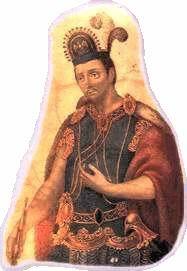 The leader of the Aztecs was the Emperor Montezuma. Montezuma was a man approximately forty years of age He had a long but cheerful face, and wore his hair just long enough to cover his ears Montezuma was of above average height and well proportioned, not fat His black beard was scanty and well-shaped He bathed everyday in the afternoon and never wore the same clothes two days in a row. Montezuma had many mistresses, all of them daughters of chieftains, and two legitimate wives His chefs cooked thirty dishes for every meal. Daily, they cooked pheasant, wild boar, quail, turkey, rabbit, partridge, duck, and venison. He loved to drink cacao. When he ate, his servants would place a gold screen in front of him so that no one could see him eating As he ate. two women waited at his side m case he needed tortillas, which he liked kneaded with eggs He maintained a large troop of dancers for his amusement, and while he ate he was entertained by singing, dancing, people on stilts, gymnasts, and humpbacks who were made to look like jesters He kept over two hundred chieftains in his guard in rooms close to his if they wanted to speak to him they had to enter the room barefoot with their eyes down. They were not allowed to look at his face. 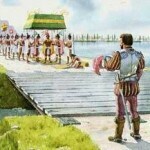 When word of the arrival of Cortes and his men arrived in Tenochtitlan, things couldn’t have been better. Major social unrest already existed, when a bolt of lightning struck and damaged a major temple A short time later, a comet appeared and frightened the population of the city. Then to make things worse. Aztec mythology told them that Quetzalcoatl would be returning to claim his kingdom. Hernando Cortes was a native of Medellin in the Spanish providence of Estremadura As a young man, he was determined to have a military career In 1504, at the age of nineteen he embarked for the island of Hispanola Soon after arriving in Hispanola. Cortes participated m his first battle, suppressing an uprising of Indians who had become enraged due to Spanish mistreatment. For this he was given an encomienda (a grant of land and free labor by the natives). 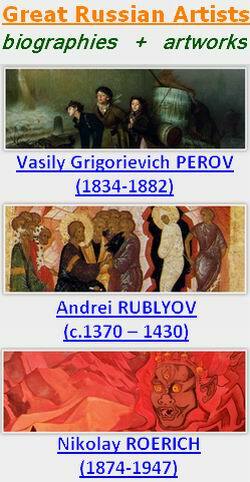 Then in 1511, he served under Diego Velazquez in the conquest of Cuba. After Captain Juan de Grijalva returned to Cuba from Mexico with 16.000 pesos of jewels and gold, the now Governor of Cuba, Diego Velazquez decided to organize another much larger fleet to sail to the Mexican mainland. This time he ordered ten ships and had them furnished with cassava bread and salt pork for the voyage To the surprise of many, he appointed Cortes Captain General of the entire fleet The first thing that Cortes did was to go out and buy arms, guns, crossbows, gunpowder, and items that had value for barter. 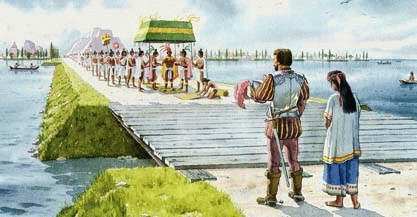 In February of 1519, Cortes set sail with about six hundred men. They landed on the coast of Tabasco and immediately found themselves in a small skirmish. It was here that they met Donna Marina who would serve him as interpreter, advisor, and eventually the mother of his son She spoke Coatzacoalcos and Nahuatl which were common in Mexico at that time. She also knew the same language that was spoken in Tabasco as did Jeronimo de Aguilar. Aguilar translated everything that she said into Castilian for Cortes. Historians have always referred to Donna Manna as Malinche. However, Bernal Diaz del Castillo in his eyewitness account en­titled, “The Discovery and Conquest of Mexico”, tells us quite a different story. He tells us that even Montezuma called Cortes Malinche. He states on page 150. ‘Before going on any further I wish to say that in the towns we passed through, and in others where they had heard of us. Cortes was called Malinche, and so I will call him Malinche from now henceforth (in his book) in all accounts of conversations which were held with any interpreter, was always in his company, particular when the ambassadors arrive, and she spoke to them in the Mexican language So that they gave Cortes the name of ‘Marina’s Captain’ and for short Malinche”.